Involves sharing of user profile / user identity and a single identity that holds the badges. Member — Someone who has identified themselves as the collector of the badges. Badge Owner might be a better term. Principal — the unique identifier under which badges are earned. Register Device — associates the apps with the principal (representing a user) who accumulates badges. In-Game Badge Display - At least an Icon for the badge with links to the details. WordPress Badge Display - Full details for the Badge; this is the reference page for a badge. Publishing Badges — happens independently of the awarding of the badge, and allows badge owners to "carry" their badges around and if they want, present them via Credly or Linked-In. Once registered, the device becomes the credentials for logging in. It would be possible for someone to take your device and collect badges for you, but it is your device that performs the work of earning the badges. Ownership of a badge can authorize access to portions of the application. Expect that most of the association between the WordPress part and the Game part will take place via an API. Synchronizing the two will be interesting. Need to lay out what data is recorded on each side. There are two Databases: One we control and one that BadgeOS controls. 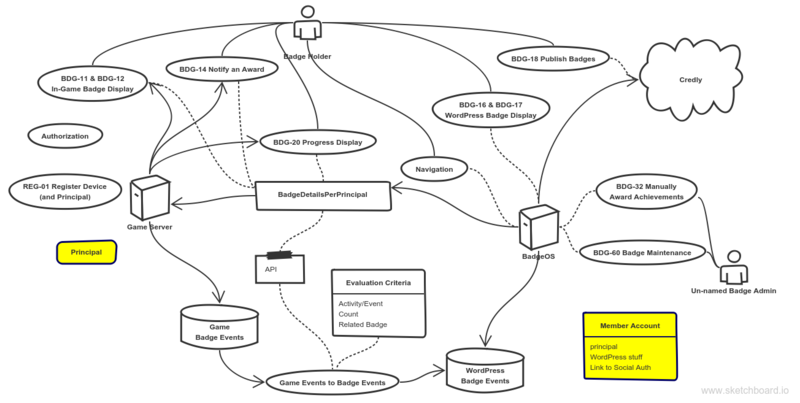 This is a fundamental design decision that allows us to upgrade BadgeOS with minimal impact to the Game database. WordPress BadgeOS Events are part of the BadgeOS plugin. The plugin has workflow built-in. Game Badge Events database holds what we generate per principal playing the game or maintaining courses. Badge Maintenance and Badge Issuance are defined by the BadgeOS functionality. The ability to flag visits to specific pages is limited. The LearnDash may be appropriate for most complicated visits, but it should be possible to trigger a server-side call to the Award Badges API from any page that I want. Perhaps a widget that links to the achievement being given. For posts to social media, I'd like to automate the sharing from the app so the app is able to trigger the call to the Award Badges API. Points are accumulated across the entire constellation rather than totalled according to some categorization or classification. There are no separate buckets for points. This means we'll want to decide on a specific meaning for the points and only award points in that category. There may not be badges associated with reaching a certain level of points, although it sure seems like this would be a useful thing. Picture of where the records are stored. Evaluation Criteria may be maintained to some extent within BadgeOS. How much can be leveraged? Learning how to organize these will be a big help. Learning where time is consumed will be a big help. What will the API look like? Annotation of classes so events are generated automatically when someone commits updates, visits pages, or whatever within the API against a session which is tied to an account.